Home » All Articles » Which state senators support Amendment 8, the Foreign For-Profit Charter Enrichment and Local Democracy Destruction Act? Which state senators support Amendment 8, the Foreign For-Profit Charter Enrichment and Local Democracy Destruction Act? 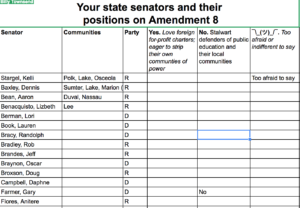 Where does your state senator stand on Amendment 8, the utterly shameless windfall for shady, foreign, for-profit charter schools developers and attack on community public education? Let’s find out together, shall we? I’ve started a tracker, and I’m asking for senators to share their positions. Screen shot preview below. I’ve been trying to get Kelli Stargel, R-Lakeland to answer for days on Twitter. Crickets. Her opponent, Bob Doyel, is strongly against Amendment 8 because he’s a strong supporter of public schools and teachers. You can learn about and support Bob here, if you choose. Stargel, of course, is perhaps the single most anti-teacher, anti-public education elected official in Florida. Every bad thing Florida has done to teachers and schools during her tenure has Stargel’s name attached to it, including Florida’s endless starvation budgets for schools. Let me tell you: of course, she supports this amendment. But thanks to the competitiveness of her race, she’s afraid to say it out loud. Let’s make her say it. So, if you want to help, call or write your state senator. Ask them: Do you support public education and teachers? Or do you support foreign for-profit charter companies trying to come here to make a buck off our kids with no oversight? Let me know what they say, preferably by tweeting me at @billytownsended or emailing at bitown1@gmail.com. As of today, only Gary Farmer, a South Florida Democrat, has confirmed his strong opposition to 8. But we’re just starting. Amendment 8: the wealthy foreign charter developer enrichment act. To answer that, let’s look first at who is funding the campaign to approve it. Here’s an invaluable story about that. It’s worth noting that these are not your local, non-profit operators, like Lakeland Montessori and Lake Wales Charter. These are big, for-profit operators looking to cash in. Why would rich foreign nationals trying to buy their way into America (while we terrorize desperate, poor toddlers at the border) see Amendment 8 as a golden ticket? I added the emphasis in that line, the italics. It’s what you call a snooker. Even conscientious voters who read more than ballot summaries of the constitutional amendments could easily miss its carefully cloaked meaning. You see, school boards already operate, control and supervise the public schools in their counties, but adoption of this amendment would seemingly limit their authority to only those schools established by each county government. In other words, charter schools and other private operations, set up by companies that give big campaign contributions to governors and legislators, would be beyond the governance of your local, elected county school board members. Rather than justifying their qualification and necessity at the local level, where board members know the needs of children and teachers, the privateers could just go to the state level and get the go-ahead to set up shop. The state’s Constitutional Revision Commission, which was appointed by U.S Senate Candidate Rick Scott Rick Scott, Speaker of the House Richard Corcoran, and Senate president Joe Negron. It is an extension of anti-education, anti-teacher, pro-corporate charter cash-in policies they pursued during their time together in the last two sessions. The sponsor of the actual amendment is School Board member — and CRC appointee from Collier County named Erika Donalds — who has been trying to use the fleeting power afforded her by the Scott/Corcoran/Negron triumvirate to hurt community public schools as thoroughly and lastingly as she can. She is part of a thing called the Florida Coalition of School Board Members. It is essentially a handful of School Board members — including Joe Negron’s wife, Rebecca — who despise public education and teachers. One of them, an unintentionally hilarious guy named Shawn Frost, announced to the world back in 2017 that FCSBM let me win my election. Really. Dude said, “we let you win.” Read this post to laugh, if you want. Who was the FCSBM’s best buddy back in 2016, when they seemed to be ascendent as an anti-public education alternative to the Florida School Board Association? The FSBA represents county school boards — not school board members —which is why its dues structure and membership aren’t based on individual people. County school boards vote on whether to join the FSBA, and majority rules. But coalition members, with support from Republican lawmakers, argued they should have the choice of what professional association represents them. Sen. Kelli Stargel, R-Lakeland, took up the coalition’s cause this session, sponsoring a bill that would let school board members direct their dues to whatever organization they wished. The bill also targeted the FSBA for participating in the tax-credit scholarship lawsuit. It would have barred the FSBA from using taxpayer dollars — i.e. the dues its members pay — from suing the state in the future. The fact that Kelli is now desperately hiding from Amendment 8 and her FCSBM buddies indicates that the FCSBM’s 15 minutes are done. This is a last shot at relevance and/or payoff, I think. And then we’ll be done with them. Like a lot of bad public/political operators, the FCSBM confuses shamelessness with cleverness. The League of Women Voters has already sued over the deliberately misleading structure of the amendment. Win or lose, the lawsuit helps to point out that this is a fraudulent attack on public schools, teachers, and communities. Indeed, Amendment 8 is a lot like 2016’s fake solar amendment, which voters also came to see through and reject handily. I’m similarly confident that at least 40 percent-plus-1 of Florida voters will recognize this as a shameless, open insult to them. Even if you love for-profit charter schools, the stench of fraud that this amendment hangs on them is disastrous for your cause over the long term. If you’re a corporate charter-lover, you can decide if I’m concern trolling you here — or just telling you the truth. Here’s a hint: I’m doing both. If you doubt me on the politics of fraudulently pushing for fraudulent charter schools, just listen to the deafening silence of Kelli Stargel. Let’s not let her — or anybody else — get away with hiding. You, senators, own this amendment, until you don’t. Speak up. Billy, can you tell me where you got that list of Senators and their replies? Did you make the calls yourself or is it from another source? Please cite the source, if so.